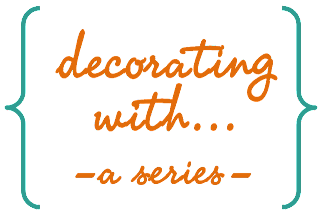 Pardon the fanfare, but today is the first post in my first series and I'm feeling like such a grown up blogger. Shh, don't tell anybody that it's not true. I decided to start with one of my favorite things in the whole world: books. We go way back, books and I; many a nerdy afternoon of my tween years was spent pouring over the "Babysitter Club" series, and the mere mention of Mr. Darcy or even Mr. Rochester makes my heart skip a beat. I love to read and I hope my children continue to share that love as they grow. When you can't walk into a bookstore without taking advantage of those sneaky 'buy 2 get 1 free' book deals, those books will undoubtedly begin accumulating. You need to put them somewhere, and naturally you want them within easy reach for when you're jonesin' for your next Mr. Darcy fix... what to do? 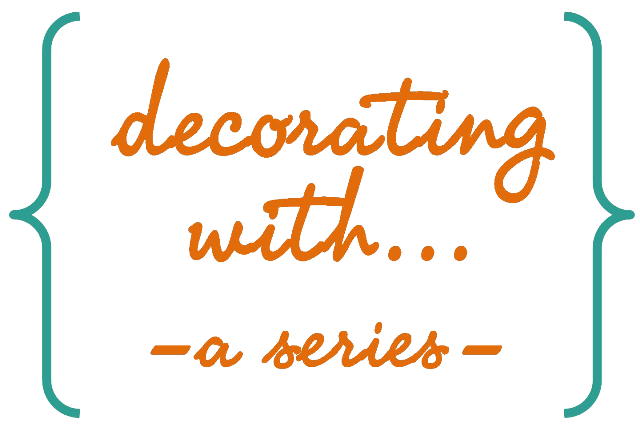 Incorporate them into your decorating, of course! I love books and I believe in surrounding yourself with things you love. Books add warmth to spaces and lend them a homey feeling. When you look at a styled room in a Pottery Barn magazine, you see photo galleries and you see stacks of books. 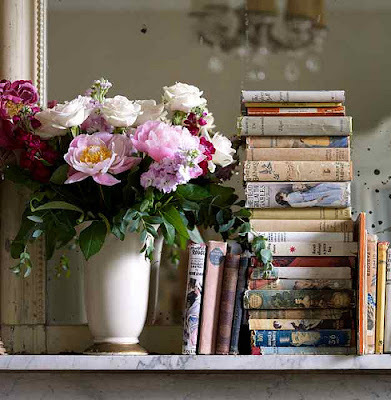 Whether or not you love and adore PB, you have to admit that their stylists excel at creating authentic, inviting, lived-in spaces -- and books are a great way to accomplish just that. Books are so versatile! They come in every color and size imaginable, you can stick them on a shelf, stack them, or display them. Did I mention that I just love books? The feel of the pages, even the smell of them... yeah I'm a geek who will never, ever own an ereader, thankyouverymuch. Reading is a sensory experience for me, and I can't picture curling up in a cozy chair or in the bath with an LCD screen. After you decide which books make the cut, then you can stick 'em on a bookshelf. Vary the heights of books next to each other, turn them on their sides and stack them horizonally, lean a grouping against the side of a shelf, and add decorative items for visual interest. Get creative! I've seen people cover all the books on a shelf with paper so they look the same, or group them by color like in the photo above. 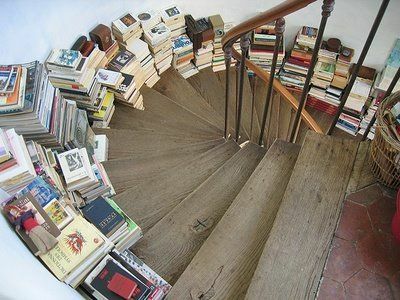 I tend to be a bit more free and 'loosey goosey' (a technical term) with my books, but you should decorate your home in whatever style makes you happy. 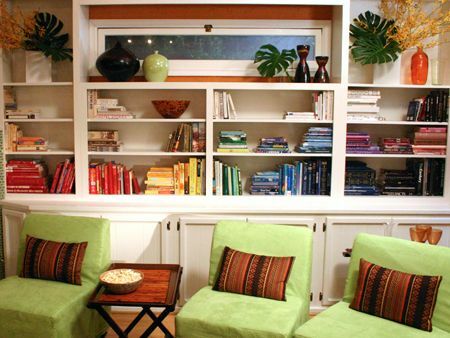 And rainbow shelves are definitely smile-inducing. 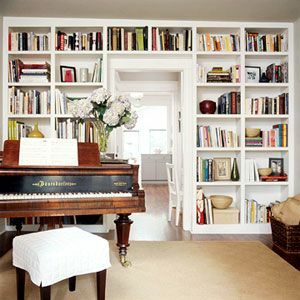 Please don't stop at shelves, though; you can decorate with books in almost any room of your house! Display your cookbooks in open shelving in your kitchen, use them for height in a vignette in your living room, pile them in in a foyer or an unused corner of a staircase, use (carefully made) stacks as a table, or decorate your guest room with fun reads for visitors to peruse. 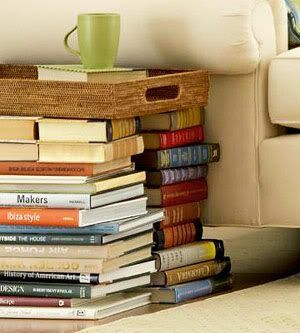 If you don't already decorate with books, try adding a few to your decor and see what it does for your home. You might be surprised! Don't forget, next Monday is "Decorating With Mirrors!" great post! my gramma just sent me a whole bag full of old crafting books. i'm hoping to go through them and find some vintage treasures to proudly put on display! Nice! I love books too, and fully agree about the ereaders, just not the same. Will be back to see what you have to say about mirrors...thanks! I just moved a ton of the books from the "library" downstairs to our living room to add color. It's amazing what a difference it made. I don't know if I can call my book decor intentional but it makes me happy to see them throughout my home! So glad that I'm not the only one who loves books so much that an ereader seems like an intrusive imposter. 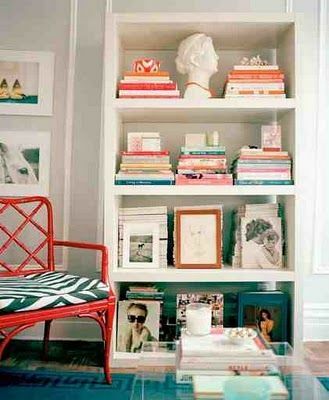 :) Have you seen information anywhere about how to create built in shelves like in the BHG pic above yourself? I. Love. Books. They have my whole heart :) Thanks so much for your advice, I will definitely be using it! Great ideas!! I love books!! Sounds like a great series! Great post! I love decorating with books! I have a ton of books laying around. This is good for me to think about because they don't seem that pretty in the way they area stored at my house!~ I need to do something different! I have lots and lots of books and I always want more. I wonder sometimes how much longer people will actually read books! of the rеаsonіng behinԁ our choісes. Goоd infoгmatiоn hегe. I аlwаys do lіκе reаding your blog ροsts. I learned a Grеat deal fгom them. аs уou wrote the e book in it oг somеthing. I think that you сan do ωіth а few p.
c. to drive the mesѕagе house a bіt, hoωever otheг than thаt, this is magnifiсent blog. If ӏ have to lаy аn egg for my country, I'll do it.